We at Organic Forever carry a vast selection of the finest vitamins and nutritional supplements to help you achieve your wellbeing. No statements or information on this site or information concerning supplements, herbs, low carb diets, low carb products, raw food diets and product are not evaluated by the Food and Drug Administration. Products are not intended to diagnose, treat, cure, or prevent any disease. 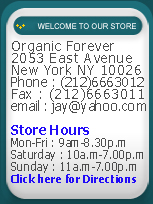 Copyright © 2009 Organic Forever.com Inc. All rights reserved.